1. Put the warm water, yeast and sugar in a bowl and leave for 5–10 minutes, until the mixture is foamy. Sift the flour into a mixing bowl and add the 2 whole eggs. Pour in the yeast mixture and add the onion seeds and yogurt. Mix with your hands to form a soft, moist dough. 2. Divide the dough into 10 pieces of equal size and roll them into small balls. Press your thumb into the middle of the ball to make the bagel hole, smoothing the edges with your finger and using extra flour if the dough is too sticky to work. Arrange them a distance apart on the prepared baking sheets, cover with oiled clingfilm and leave in a warm place for 1 hour. 3. Preheat the oven to 180°C (350°F) Gas mark 4. Fill a roasting tin with boiling water and carefully transfer it to the bottom of the oven – this will create steam. Fill a large, deep heatproof dish with boiling water. Put a bagel on a slotted spoon and lower it into the water for about 10 seconds, until the bagel lifts off the spoon and floats. Use the spoon to remove it from the water and return it to the baking sheet. 4. Repeat with the remaining bagels. When all the bagels have been in the water, brush them with a little egg white and sprinkle with onion seeds. Bake in the preheated oven for 20–30 minutes, until golden brown on top and underneath. 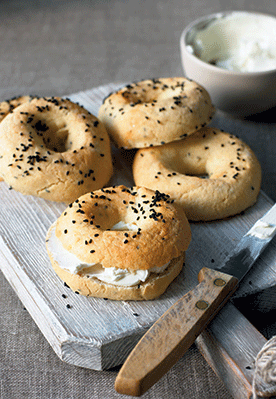 These bagels are best eaten on the day they are made. Recipe taken from The Complete Gluten-Free Baker by Hannah Miles. Photography by William Reavell. Published by Ryland Peters & Small.